This dish was created on a whim. We were having my in laws over for a last minute dinner and I didn’t have time to get to the market so I needed to make due with what we had on hand. I planned on making a pork tenderloin we had in the freezer with a cranberry sauce and roasted potatoes. I had a bag of green beans in the freezer that I thought I would put to use but I felt the meal needed something saucy and cheesy so regular old roasted or sautéed green beans were not going to cut it. I have had many gratins: spinach, cauliflower, potato and so on. I had also had “green bean casserole” and could do without all of the canned, processed soup. So here was the result: Green Bean Gratin. This gratin is, without a doubt, Thanksgiving feast worthy. It is dynamite…really really tasty and the reviews were out of this world. Aside from being absolutely delicious and nothing but REAL ingredients it could not be more simple. It’s almost embarrassing to share this with you because there is just nothing to it. Easy peasy AND delicious comfort all in one? Yes please….Ill take two. Use whatever dried whole grain breadcrumbs your family prefers. I made my own with sprouted grain bread and they worked great. Preheat oven to 375 and grease a 9×13 baking dish. 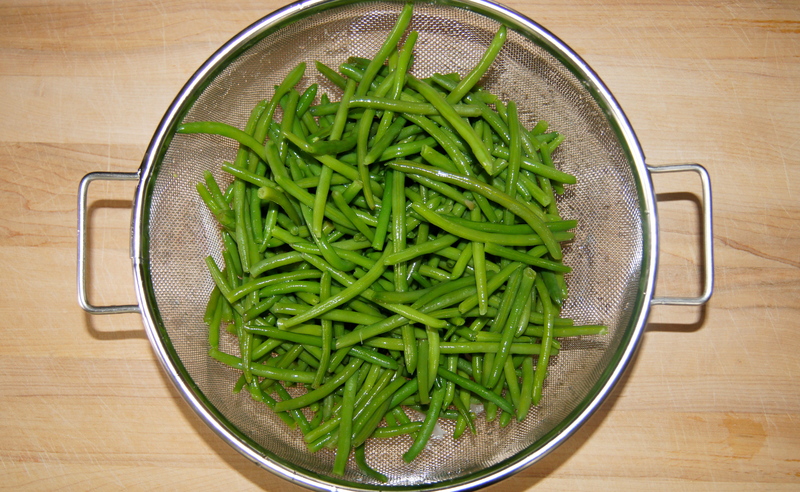 Bring a medium sized pot of water to a boil, add green beans and cook for two minutes; drain and dry the beans on a kitchen towel or paper towels. Stir the nutmeg, salt and pepper into the cream. 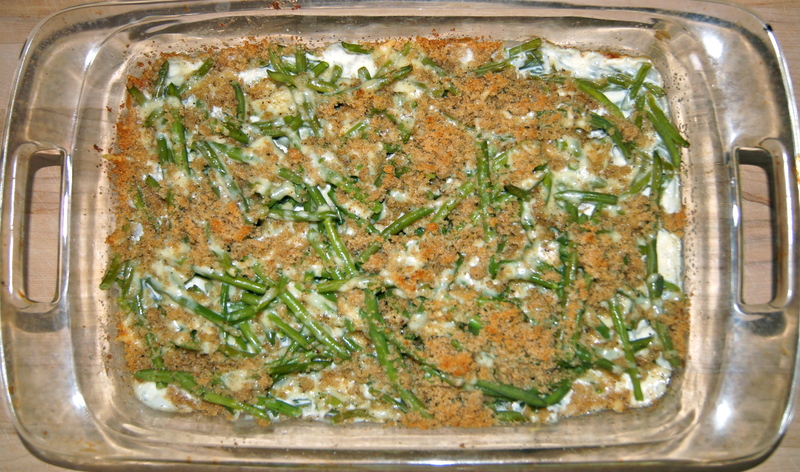 Spread out half of the green beans in the baking dish, top with half the cheese and half the cream. Repeat with remaining green beans, then the rest of the cheese and the rest of the cream. Mix breadcrumbs and olive oil in a small bowl and sprinkle them on top of the gratin. Bake, uncovered, for 25 minutes or until sauce is thick and bubbly and breadcrumbs are browned. Serve immediately. Serves 4. I made this for Thanksgiving and it was a big hit and wonderful. Thank you! I liked this very much but unfortunately the men in my house still prefer that tired old green bean casserole with the french fried onions on top. Oh well, I prefer this, so maybe I’ll make both next year. Thanks for a great recipe! Sharon…it’s so hard to get those “traditional” bellies to enjoy something new…especially with a classic dish like green bean casserole! I’m so glad you enjoyed it tho…let me know what you decide for next year!